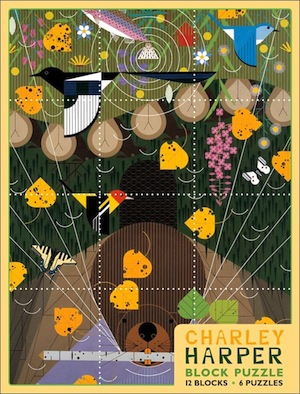 A block puzzle featuring six illustrations by Charley Harper. Pomegranate block puzzles are composed of twelve 2" square blocks which may be flipped and turned to form six different artworks. Isle Royale (detail). Twelve 2" laminated cardboard blocks in a decorative box. Puzzle size: 6 x 8 in.